William Robert "Sliding Billy" Hamilton (February 16, 1866 – December 15, 1940) was a 19th-century Major League Baseball (MLB) player who holds a number of baseball records. 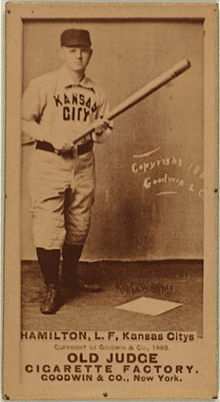 He played for the Kansas City Cowboys, Philadelphia Phillies and Boston Beaneaters between 1888 and 1901. He was elected to the National Baseball Hall of Fame and Museum in 1961. As of early 2019, he is third on the all-time list of career stolen bases leaders. Hamilton was born on February 16, 1866 in Newark, New Jersey. His parents, Samuel and Mary Hamilton, had emigrated to New Jersey from Ireland. Biographer Roy Kerr writes that evidence suggests that Hamilton was descended from the Ulster Scots people. (As an adult, Hamilton was known to proudly proclaim his Scottish ancestry.) When Hamilton was a small child, his family moved to Clinton, Massachusetts. He worked in a Clinton cotton mill as a young teenager. In 1892, Hamilton hit both a leadoff and game-ending home run in the same game. Only Vic Power (1957), Darin Erstad (2000), Reed Johnson (2003) and Ian Kinsler (2009) have accomplished the same feat. He hit .380 in 1893, which led the major leagues. Hamilton retired after the 1901 season. Over his career he compiled 912 (or 937; see this article's "legacy" section) stolen bases, a .344 batting average and 1690 runs in 1591 games; he is one of only three players to average more than one run per game played. His .455 career on-base percentage ranks fourth all-time behind Ted Williams, Babe Ruth and John McGraw, and his 912 stolen bases ranks third behind Rickey Henderson and Lou Brock. Hamilton died on December 15, 1940, at his home at 6 Lucian Street in Worcester, Massachusetts. He was survived by his wife Rebecca (Carr) Hamilton, four daughters and two grandchildren. He was inducted into the Baseball Hall of Fame in 1961. ^ While most sources list this date of birth, biographer Roy Kerr writes that Newark archives suggest a date of birth of February 15, 1866. ^ Solomon, Abbot Neil (1988). Baseball Records Illustrated, Quintet Publishing, London. ^ Hamilton, Billy. Baseball Hall of Fame. Retrieved on April 12, 2014. ^ Billy Hamilton Statistics and History. Baseball-Reference.com. Retrieved on April 12, 2014. ^ a b "Billy Hamilton, 74, ex-baseball star". New York Times. December 16, 1940. Archived from the original on December 17, 1940. Retrieved January 9, 2016. This page was last edited on 2 March 2019, at 22:19 (UTC).